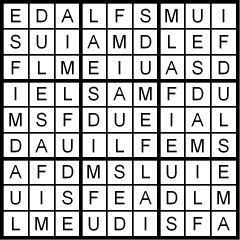 You can see that the anagram and the hidden word are related; but the 'clue' in the anagram is worthless ahead of time: You have to unscramble it--solve the hidden word puzzle--to see the relation. That's how I planned it! 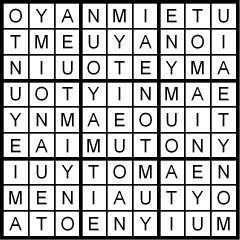 A new puzzle later this morning. 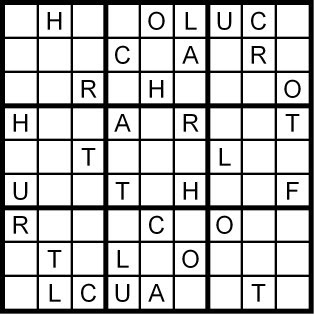 Later this morning, your Sunday Challenge! 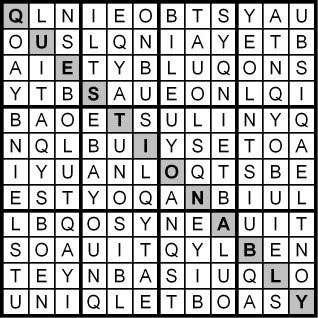 Solution tomorrow morning...and later tomorrow, the Sunday Challenge, a 12x12 Hidden Word Sudoku puzzle. 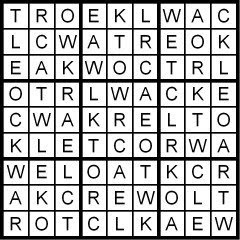 A new puzzle in just a little while. And please don't forget tomorrow's Sunday Challenge! 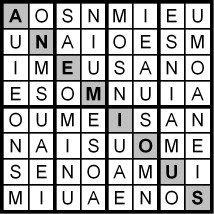 The second puzzle was NOT so easy. 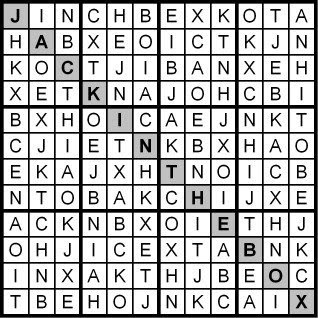 I think 16x16 puzzles are pretty hard to begin with; but then throw in the complication of using the solution to the Word Sudoku puzzle to unravel a hidden quote... 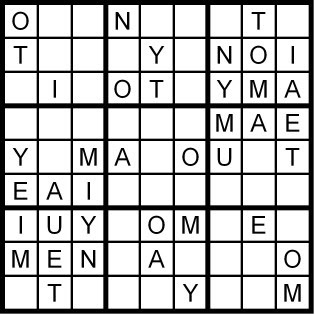 The 16-letter Word Sudoku was based on the nonsense phrase POULTRY BEGAN SKID...you can see that it has a loose, unusable tie to the hidden quote. Sorry 'bout that! 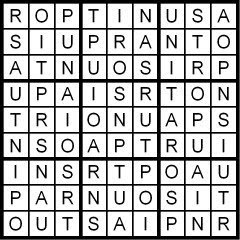 A new puzzle later this morning. 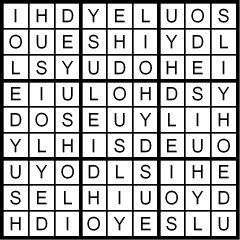 And please visit Sunday for the 12x12 Hidden Word Sudoku Sunday Challenge. And now, the challenge. 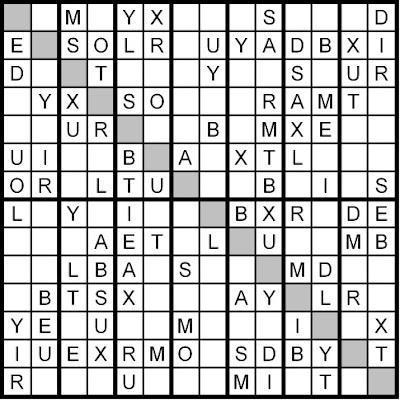 It comes in two parts: first, a 16x16 (4x4 internal squares) Word Sudoku Puzzle. 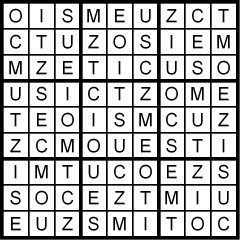 You'll notice that a number of cells are circled and numbered; they're the letters used in the hidden quote in the second part of the puzzle. 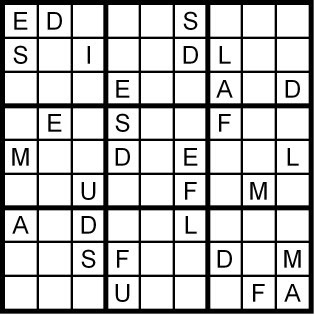 As you solve the Word Sudoku puzzle, you'll fill in the circled cells; then copy that letter into the cell in the quote grid with the same number, to (slowly) reveal a famous quote. 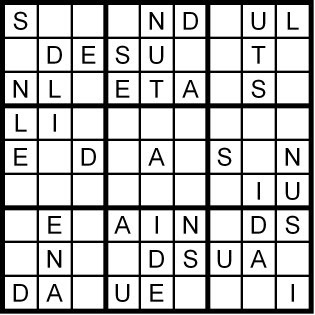 You can apply your "world knowledge" to the quote, to help you fill in more letters and then transfer them back into the Sudoku puzzle--but you don't need to do that; the Word Sudoku puzzle is designed to be solved independently of the hidden quote. 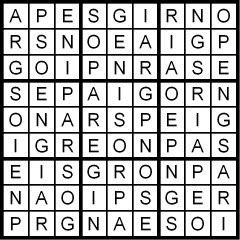 Please let me know what you think of this type of puzzle. 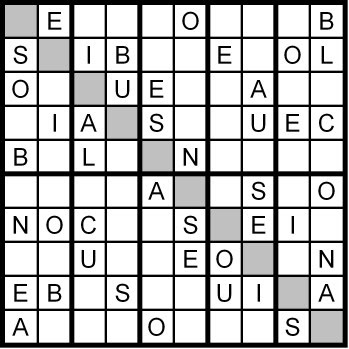 I have compiled two whole books of these puzzles, aptly titled AEIOU SUDOKU, for the obvious reason. Solutions tomorrow. And don't forget to visit Sunday for the Sunday Challenge! Coming your way in just a few hours: A real challenge! Solution tomorrow morning. 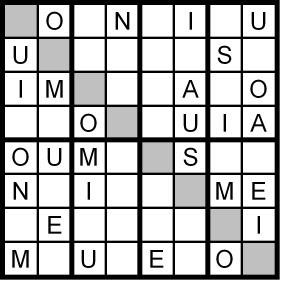 And also tomorrow, a tough-but-fun puzzle involving a 16x16 Word Sudoku puzzle *and* a hidden quote...check it out! 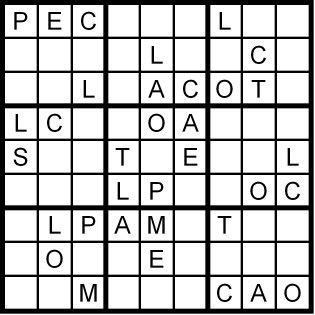 Another puzzle for you shortly. 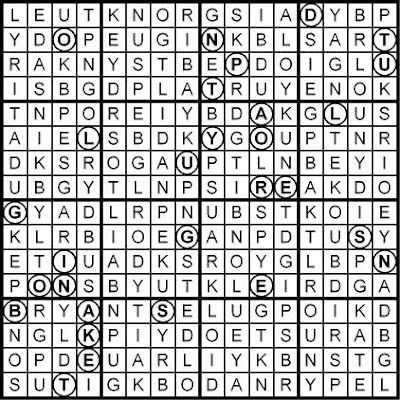 And for the fun of it, here's an extra challenge, a 9x9 Hidden Word Sudoku puzzle with anagram PET CRANKS; the hidden word or phrase is revealed down the diagonal--which, don't forget, gives you more information, since the one diagonal must also follow the rule of using each letter in the word or phrase exactly once. Solutions first thing tomorrow morning. 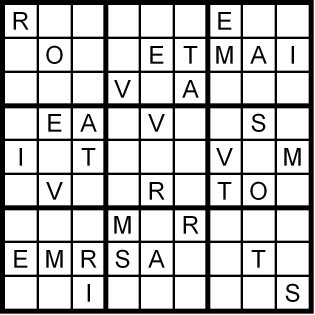 A little later this morning, TWO puzzles for you. 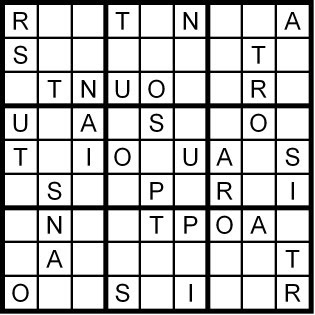 A new classic 9x9 Word Sudoku puzzle coming your way in just a little bit. 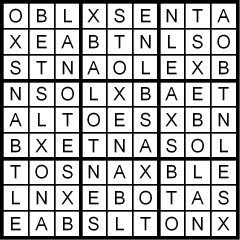 Solution tomorrow, and a new puzzle after that. Later this morning, the Sunday Challenge! Solutions tomorrow. 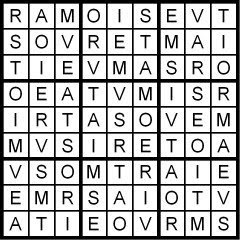 And tomorrow is Sunday: Please check out the Sunday Challenge! 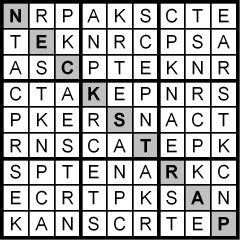 Again, the anagram provided a clue (but not a helpful one) to the hidden word. 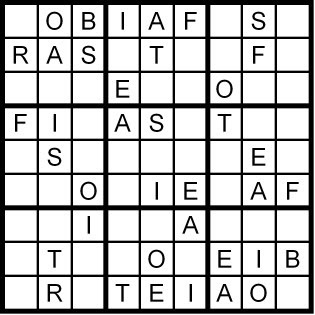 A new puzzle, shortly. 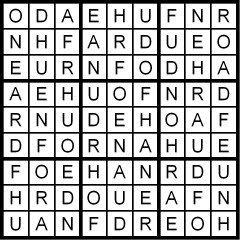 And don't miss the Sunday Challenge 12x12 Hidden Word Sudoku puzzle tomorrow! 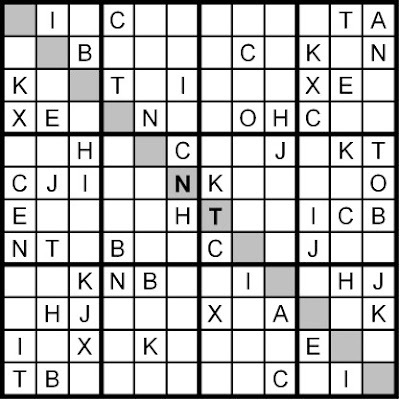 And here's your real challenge today: a 10x10 Hidden Word Sudoku puzzle, using 2x5 internal rectangles. 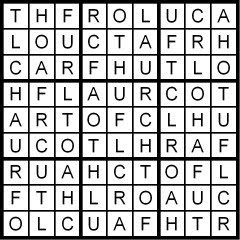 Remember that the rule expands: Each row, column, 2x5 rectangle and the one diagonal contains the letters in the anagram CABIN LOUSE exactly once; the hidden word or phrase is revealed down the diagonal as you fill in the grid. Solutions tomorrow. 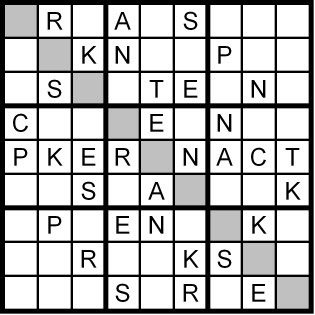 And we're close to the weekend; plan to visit Sunday for the 12x12 Hidden Word Sudoku Sunday Challenge! 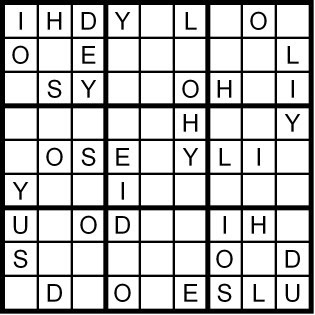 Two puzzles coming your way in a couple of hours, including a 10x10 (2x5 internal rectangles) Hidden Word Sudoku puzzle. 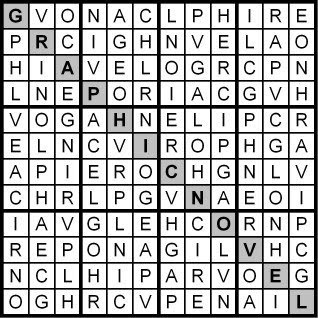 You can see, after the fact, that the anagram contained a hint to the hidden word...but it didn't help, did it? 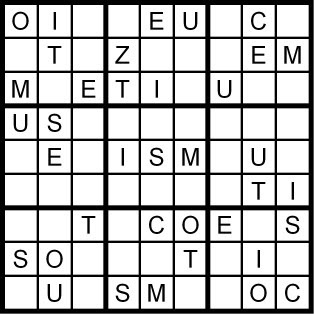 Please let me know how hard this puzzle was for you. Or was it?? The usual and a challenge for you today! 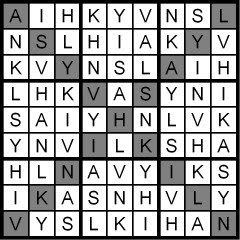 And here's your challenge: a 14x14 Hidden Word Sudoku puzzle. 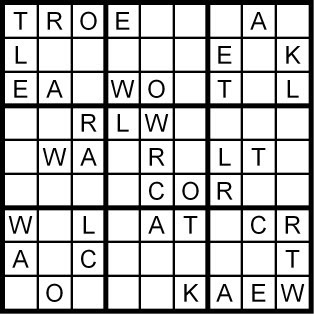 Using the letters in the anagram DOUBLE ARM SIXTY, and remembering the rule that each row, column, 2x7 rectangle and the one diagonal contain the letters in the word or phrase exactly once, fill in the grid. Also, remember our previous discussion on how a pair of columns and two stacked rectangles interact when the rectangles are two columns wide. 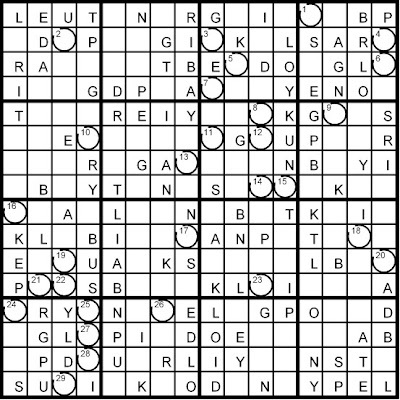 Later today, a challenge: a 14x14 Hidden Word Sudoku! Solution tomorrow morning. 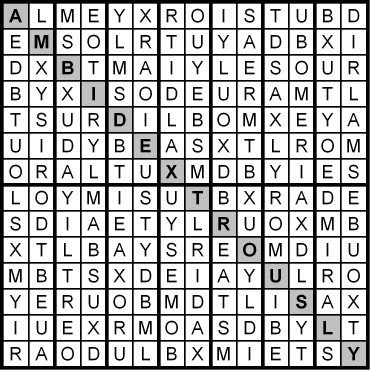 And then later tomorrow, besides the usual puzzle, I'll give you a real challenge: a 14x14 Hidden Word Sudoku puzzle, with 2x7 internal rectangles. 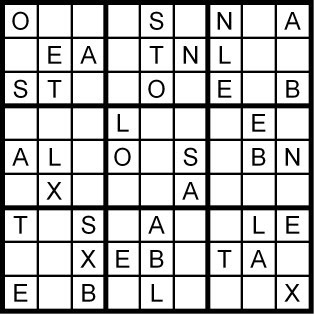 Today's puzzle is a 12x12 Hidden Word Sudoku puzzle based on letters that form the anagram KITCHEN AX JOB. 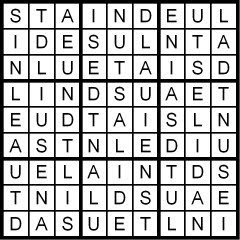 As you solve the puzzle, the hidden word or phrase is spelled down the diagonal. Good luck! Solution first thing tomorrow morning. 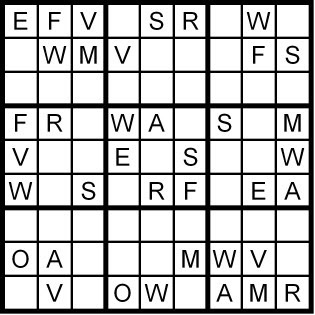 Solution tomorrow morning, and then, a little later tomorrow, your Sunday Challenge--a 12x12 Hidden Word Sudoku puzzle using 3x4 internal rectangles. Solution tomorrow morning. 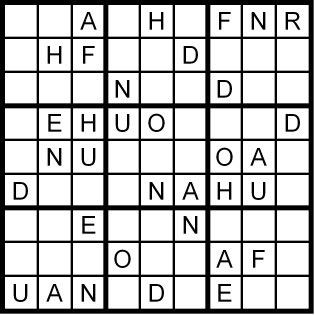 And a new Word Sudoku puzzle each and every day! 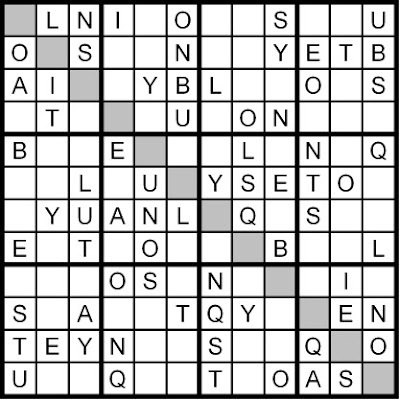 And please plan to check us out this coming Sunday, when I'll present you another Sunday Challenge--a 12x12 Hidden Word Sudoku puzzle using 3x4 internal rectangles. 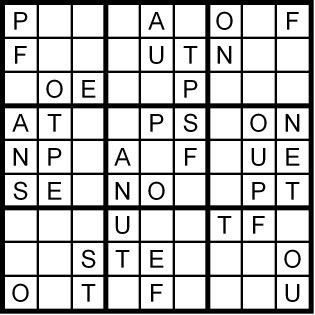 A new puzzle in just a few hours! 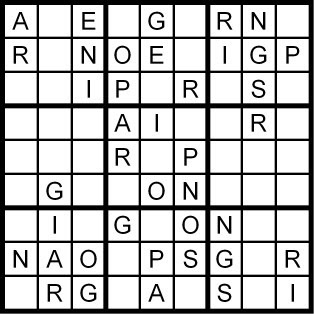 Another puzzle for you later today. 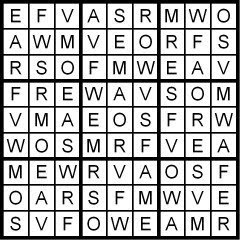 Today's first puzzle is a simple, classic Word Sudoku puzzle based on the word WAVEFORMS. 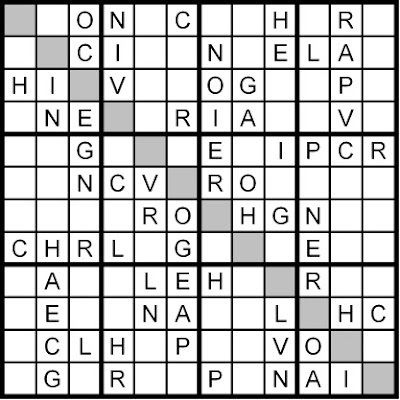 Your second puzzle is actually also simple, but it's not usual: It's an 8x8 grid, with internal 2x4 rectangles instead of the usual 3x3 squares. 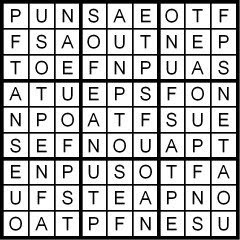 And it uses an 8-letter word or phrase; the letters form the anagram I USE MOAN. 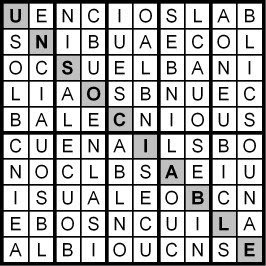 As you solve the puzzle, the actual hidden word or phrase is spelled down the diagonal. That's a huge help! 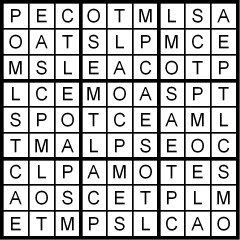 Try it... Solutions first thing tomorrow morning.